Immunogen: Synthetic peptide corresponding to the sequence near the N-terminus of human DRAM. Scientific Background: Damage-regulated autophagy modulator (DRAM) is a p53 target gene encoding a lysosomal protein that induces autophagy, a process that degrades cytosolic proteins and organelles. It has been suggested that activation of DRAM by p53 is simultaneous to the activation by p53 of one or more proapoptotic genes such as PUMA and Bax, and that the signaling pathways regulated by these genes together promote a full cell death response. Western blot analysis of DRAM in K562 cell lysate with DRAM antibody at (A) 0.5, (B) 1 and (C) 2µg/ml. 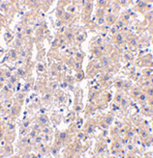 Immunohistochemistry analysis of DRAM in human liver tissue with DRAM antibody at 2.5µg/ml.